2014 Tatomer, Pinot Noir, Santa Barbara County. In a few short years Graham Tatomer has given us amazing Gruner Veltliner and Riesling offerings to ponder and be thrilled by, helping elevate the two varietals in California, he trained with Weingut Knoll in the Wachau, one of the world’s great producers and brought back a gifted touch and talent for Riesling and Gruner, plus now he is making a fine collection of Pinot Noir. The latest set of Gruner and Riesling are some of the best efforts to date and his sweet Beerenauslese like Riesling is outstanding too, certainly it ranks as one of the top stickies in the State, though I must say I was moved by Graham’s latest Pinots most of all, especially his single vineyard Duvarita, which I’ve mentioned prior, and the wonderful Spatburgunder styled Santa Barbara County Pinot 2014, this was my new wine of his road show in the City this week, it is a light to medium offering with brilliant color and complexity with dreamy textures and exotic spices. 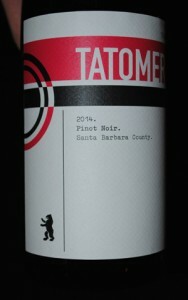 The 2014 Tatomer Pinot Noir Santa Barbara County comes off three sites, and is made with a gentle touch and much less extracted making for an old school, old world charmer, and I really enjoyed the soft cascade of layers, that really reminded me of some of my favorite German Spatburgunders, it has lots of freshness, vibrancy and delicacy. The nose is spicy with lovely wilted roses, smoky fruits and flinty minerals, the light and shiny ruby hue shimmers in the glass and the palate is silken with raspberry, tangy plum and black cherry fruits, savory lavender, dusty stones, truffle and mixed baking spices finishing with dried currants, red peach, tart blueberry and chalky notes, this is a gorgeous expression of Pinot Noir, be sure to look for it, it comes in a tall almost Riesling shaped bottle and drink it over the next 3 to 5 years, this wine over delivers for the price!